Spearmint is native to the Balkan Peninsula and Turkey, and it has been naturalized throughout much of Europe, the Mediterranean region and Southwest Asia [1,2]. Spearmint (Mentha spicata) is the most common herb in the Mediterranean region, widely is used as a source of essential oils for flavoring and recently has been used as a valuable source of the potent antioxidant for the nutraceuticals and also used cosmetic industries . It has been introduced to North America, Japan, Australia, and New Zealand [4,5]. Spearmint and peppermint grow best in wet or moist, slightly acidic soils . They tolerate light conditions ranging from full sunlight to partial shade . Spearmint and peppermint have impact on ecosystem processes; likely to reduce the nutrients available to native plant species, but only in moist to wet, disturbed sites . There are numerous health benefits of spearmint essential oil such as it can reduce fever, provide relief from depression and asthma . It has been wellknown that spearmint essential oils have antimicrobial and antioxidant effects . In addition to, common need is availability of natural extracts with a pleasant taste or smell combined with a preservative action, aimed to avoid lipid deterioration, oxidation and spoilage by microorganisms . It is essential oil did not show any evidence of mutagenicity in the Ames test . Spearmint has also been described as having excellent antioxidant activity comparable to BHT . Due both its antioxidant activity and its common use to season lamb in South Asian cuisine, it has been studied as an additive to radiation-processed lamb meat, and was found effective in delaying oxidation of fats and reducing formation of harmful substances, which can be detected using thiobarbituric acid as a reagent . Spearmint has been studied for antifungal activity; it is essential oil was found to have some antifungal activity, although less than oregano . The most abundant compound in spearmint oil is R (-) carvone, which gives spearmint its distinctive smell. Spearmint oil also contains significant amounts of limonene, dihydrocarvone, and 1,8-cineol . Drying and storage of rose-scented geranium herbage for five days prior to distillation significantly reduced the essential recovery as well as oil quality . After one year of storage of Black pepper (Piper nigrum L.) samples in glass vessels at room temperature, the amount of oil extracted decreased, the content of terpenes decreased and the amount of oxygenated terpenoids increased . Storage leads to gradual evaporation of essential oil from stored herbs, the major source of loss being due to oxidation and resinification of the essential oils . Therefore, investigating the effect of storage on oil content and composition under Sudan conditions is recommended. Essential oils are subject to oxidative changes in the presence of air and light and during storage. Less stable compounds may also change due to chemical interactions with other constituents . Changes in essential oil components during storage could occur by rearrangement, hydrogenation or dehydrogenation of other components . The aim of this study is to investigate the effect of storage period on spearmint herb oil for one year at ambient temperature in semi-arid conditions; and their effects on carvone content and oil composition. A field experiment was conducted at ‘Halfaya’ area and storage area at Shamabt, Khartoum North, Sudan (15° 40/N, 32° 22/E). The climate was a semi-arid, tropical, with seasonal annual rainfall of 120mm during the period mainly between Julys to September. The mean maximum and minimum temperatures are as high as 47.5°C during summer (April-June) and as low as 7.5°C during winter (November-March) . The soil was an alluvial type with high content of silt, slightly alkaline. Land preparation and cultural practices were carried out as recommended. The land was divided into 48 plots of (4.5 X 6 mm each) (30 x 30 cm spacing). At harvested the whole plot was covered with spearmint aerial herb (stem and leaves) due to spread of underground runners, which gives good aerial shoots at rhizome’s nodes. Spearmint (Mentha spicata var. Viridis) plants were raised from underground runners (rhizome-like rootstock). They were obtained from fully mature plants grown in spearmint growing area at ‘Halfaya’, Khartoum North, Sudan. The underground and surface runners were transplanted into new well prepared flat beds at (30 x 30 cm spacing). Pre-transplanting irrigation was applied followed by the first irrigation immediately after transplanting. Irrigation was carried out every 7 days. The samples were arranged in a completely randomized design, with four replications. The treatments were 12 namely: M1, M2, M3 and M4. (Where M: mean month). About two kilograms of herb samples were harvested from wellestablished 60 days plants. The aerial parts of the plants (main aerial stem, branches and leaves) were cut about 5 cm above the ground level. Foreign materials and weeds were removed immediately from the harvested material. The aerial parts of the plants (main aerial stem, branches and leaves) were cut about 5 cm above the ground for further investigations. The herb was subjected to open shade air drying for seven days. Foreign materials and weeds were removed immediately from the harvested material. The dried herb samples were kept in polyethylene bags and stored at ambient room temperature at Shambat area, Khartoum North, Sudan for 12 months. Samples were taken every four months for oil composition determination. Oil was extracted by hydro distillation and determined according to the technique of British Pharmacopoeia . The oil was prepared for oil composition determination according to British Standard 2073: 1976 . Oil composition was determined before storage of the herb samples and every four months during storage of the herb at ambient conditions during the year. Oil composition was analyzed by GC/MS analysis using a Shimadzu Qp 2010 equipped with reference libraries (The operation software is Real Time Analysis and for processing data using Postum Analysis). The column used was DE-5 mm type cross-linked fused-silica capillary column coated with 5% phenyl poly-methyl-siloxane (30 m x 0.25 mm x 0.25 mm film thickness). Column temperature was adjusted to 80°C for 10 min and increased after 10 min to 220°C. It kept for 6 min at 220°C, increased by 20°C per min to 300°C and kept for 20 min in 300°C. Injection temperature was 220°C; injection mode split: split ratio 1:40 and volume injected was 0.1 μl of the oil. Helium was used as a carrier, using 100 kPa (50 ml/ min); interface temperature 280°C; fragment of mass range 45- 450 m/z; Linear velocity 44.5 cm/sec; acquisition mode scan and programmed time was 54 min. The Carvone content decreased in general with an increase of storage period (Figure 1). Essential oils possess high level of unsaturation and are unstable due to many factors, such as light, heat, oxidation and dehydration [22,23]. Choi and Sawamura reported that most essential oils are themolabile or heat sensitive and are subjected to oxidative changes in the presence of air and light, and during storage . The degree of change is usually a function of both temperature and time. The effect of storage period on oil composition was illustrated in Tables 1-4 and Figures 2-5. The results indicated that 27 oil constituents of spearmint oil appeared during the one year storage of the herb at ambient conditions. Before storage (Figure 1) Carvone, D-limonene and Cyclo-hexexanol,1-methyl-4-(1-methyl) were the most abundant components in spearmint oil and they accounted for about 90% of the oil. During storage of the spearmint herb, these constituents varied drastically and progressively decreased afterwards. Similarly 2-Cyclohexen-1-ol,2-methyl- 5-(1-methylethyl-cis-Isopulegyl acetate) and (α-Bourbonene) increased and then decreased during storage. However, the content of D-limonene decreased considerably during storage and there was a considerable increase in Limonene, Transcarveyl acetate and Eucalyptol. Some constituents completely disappeared during storage, such as, Cyclohexanol,1-methyl-4- (1-methyle), Neo-di-hydrocarveol, Cis-p-meth-2,8-dien-1-ol and Gamma-cubebene, while others only appeared at the end of the storage period, such as p-meth-4(8)-en-9-ol, β-Phellandrene and α-Pinene. Chemical changes in volatile compounds are known to occur due to environmental conditions, such as light, oxygen, moisture, heat and storage period resulting in the formation of artifacts or polymerization . Essential oils are subject to oxidative changes in the presence of air and light, and during storage . These changes usually have adverse effects on flavor quality; most flavoring materials are to some extent thermolabile or heat sensitive. The degree of change is usually a function of both temperature and time and less stable compounds may also change due to chemical interactions with other constituents . Changes in essential oil components during storage could occur by rearrangement, hydrogenation or dehydrogenation of other components . Figure 2: Chromatogram of Figure 2 spearmint essential oil obtained from spearmint herb before storage (January). Figure 3: Chromatogram of spearmint essential Figure 3 oil obtained from spearmint herb stored for four months (April). 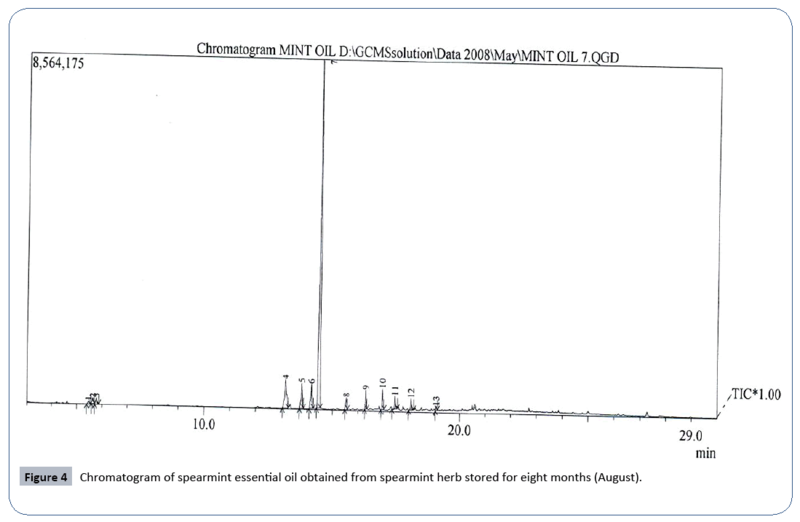 Figure 4: Chromatogram of spearmint essential oil obtained from spearmint herb stored for eight months (August). 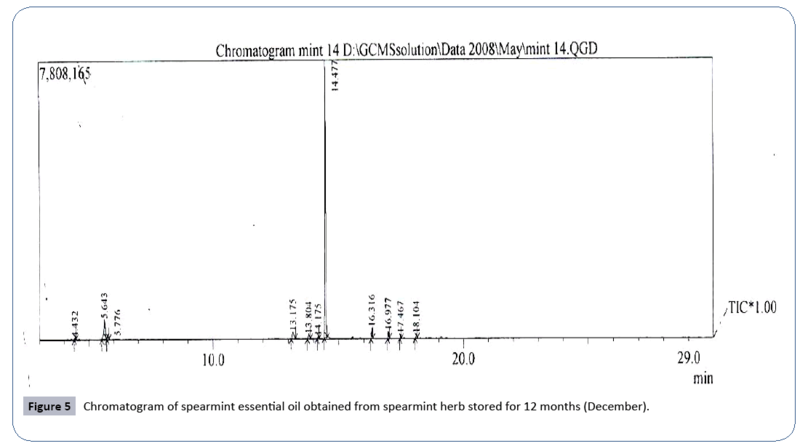 Figure 5: Chromatogram of spearmint essential Figure 5 oil obtained from spearmint herb stored for 12 months (December). The presence and absence of spearmint oil compositions during the four storage treatments was expressed (Table 5). The spearmint oil constituents under storage period varied. Some components disappeared and other appeared. This is due to phsyico-chemical condition of the Storage. The oil components undergo oxidation which leads to formation of new components; under the influence of temperature and other climatic factors (Appendix 1-3), . Essential oils are subject to oxidative changes in the presence of air and light, and during storage . These changes usually have adverse effects on flavor quality; most flavoring materials are to some extent thermo labile or heat sensitive. The degree of change is usually a function of both temperature and time and less stable compounds may also change due to chemical interactions with other constituents . Changes in essential oil components during storage could occur by rearrangement, hydrogenation or dehydrogenation of other components . We can come to conclude that Carvone content progressively decreased with an increase of storage period of spearmint herb. Other spearmint herb constituents act differently, some of which decreased in amount and other appeared or disappeared. This change in chemical constitutes are due to oxidative changes in the presence of air; oxygen; temperature and light during storage at semi-arid ambient temperature. I wish to express my thanks to the staff in the Department of Horticulture (Faculty of Agriculture, University of Khartoum, Sudan), Medicinal and Aromatic Plants Institute (NCR, Sudan), Department of Food Research Industries at (IRCC, Sudan), Mr. Mohammed Damona in Pharmaceutical Industries (IRCC) for their generous help in conducting extraction and chemical tests and Central Laboratory (MOST, Sudan) for GC-MS analysis. My thanks are to IRCC for financing this research. Kokkini S, Vokou D (1989) Mentha spicata (Lamiaceae) Chemotypes Growing Wild in Greece. Economic Botany 43: 192-202.
eFloras (2008) Published on the Internet Missouri Botanical Garden, St. Louis, MO & Harvard University Herbaria, Cambridge, MA. Wang L, Weller CL (2006) Recent advances in extraction of nutraceuticals from plants. Trends in Food Sci Technol 17: 300-312. Mito T, Uesugi T (2004) Invasive Alien Species in Japan: The Status Quo and the New Regulation for Prevention of their Adverse Effects. Global Environmental Research 8: 171-191. USDA (2010) The Plants Database. National Plant Data Center, Natural Resources Conservation Service, United States Department of Agriculture. Baton Rouge LA. Abbaszadeh B, Farahani H, Valadabadi S, Moaveni P (2009) Investigations of variations of the morphological values and flowering shoot yield in different mint species at Iran. Journal of Horticulture and Forestry 1: 109-112. DiTomaso J, Healy E (2007) Weeds of California and Other Western States. University of California Agriculture and Natural Resource Communication Services, Oakland, CA 2: 974. El-Moghazy MA (2008) Chemical inhibition effects of some plant extracts on spoilage microorganisms in food. Thesis, Faculty of Agriculture, Ain Shams University, Cairo, Egypt. Özer H, Sökmen M, Güllüce M, Adigüzel A, Sahin F, et al. (2007) Chemical composition, antimicrobial and antioxidant activity of the essential oil and methanol extract of Hippomarathrum mirocarpum (Bieb.) from Turkey. J Agric Food Chem 55: 937-942. Sacchetti G, Maietti S, Muzzoli M, Scaglianti M, Manfredin S, et al. (2005) Comparative evaluation of 11 essential oils of different origin as functional antioxidants, antiradicals and antimicrobials in foods. Food Chemistry 91: 621-632. Adam K, Sivropoulou A, Kokkini S, Lanaras T, Arsenakis M (1998) "Antifungal Activities of Origanum vulgare subsp. hirtum, Mentha spicata, Lavandula angustifolia, and Salvia fruticosa Essential Oils against Human Pathogenic Fungi". Journal of Agricultural and Food Chemistry 46: 1739-45. 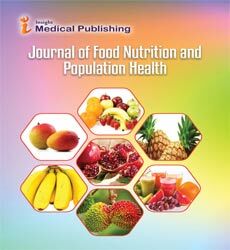 Kanatt SR, Chander R, Sharma A (2007) "Antioxidant potential of mint (Mentha spicata L.) in radiation-processed lamb meat". Food Chemistry 100: 451-8. Hussain AI, Anwar F, Nigam PS, Ashraf M, Gilani AH (2010) "Seasonal variation in content, chemical composition and antimicrobial and cytotoxic activities of essential oils from four Mentha species". Journal of the Science of Food and Agriculture 90: 1827-36. Ram P, Kumar B, Nagvi AA, Verma RS, Patra NK (2005) Post-harvest storage effect on quatity and quality of rose-scentedgeranium (Pelargonium sp. cv. Bourbon) oil in Ulttaranchal. Flavour and Fragrance Journal 20: 666-668. Williams CL, Strobino BA, Bollella M, Brotanek J (2004) Effect of storage on the essential oil composition of Piper nigrum L. fruit of different ripening states. Journal of Agricultural and Food Chemistry 52: 2582-2586. Guenther E (1975) The Essential Oils. Robert E. Krieger Publishing Company, Huntington, New York, USA. Choi H, Sawamura M (2002) Effect of stotage conditions on the composition of Citrus tamurana Hort. Ex Tanaka (Hyuganatsu) essential oil. Journal of Bioscience, Biotechnology and biochemistry 66: 439-443. Njoroge SM, Ukeda H, Sawanmura M (1996) Changes in volatile oil composition of yuzu (Citrus junas Tanka) cold-pressed oil during storage. Journal of Agricultural and Food Chemistry 44: 550 - 556. SMAR (2010) 1981-2010 U.S. Climate Normals. Sudan Meterological Authority Records (SMAR), Ministry of Environment, Forestry and Physical Development, Sudan. GMC (1968) British Pharmacopeia. General Medicinal Council (GMC) pp: 1273-1276. BSI (1976) Methods of Test for Essential Oils. British Standard Institution (BSI). 2 Park Street, W1A 2BS 5, London, UK p: 28. Walton BS (1984) The essential oils. In: The Biochemistry and Physiology of the Lemon. 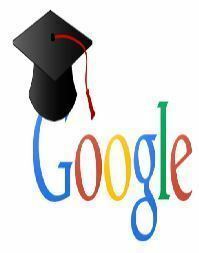 University of California, Division of Agriculture and Natural Resources, California, USA pp: 218-309. Tisserland R, Balacs T (1995) Essential Oil Safety: A Guide for Health Care Professionals. Churchill Livingstone Co., London, UK. Gopalakrishnan N (1994) Studies on the storage quality of CO2-extracted cardamom and clove bud oils. Journal of Agricultural and Food Chemistry 42: 796-798. Salim EA, Abu-Goukh AA, Khalid HE, Hassan GM (2016) Evaporation of Spearmint (Mentha spicata var. viridis L.) Herb Oil during One Year of Storage under Semi-Arid Condition. Agri Res & Tech: Open Access J 2. Swisher HE, Swisher LH (1977) Specialty citrus products. In: Citrus Science and Technology. Nagy PE Shaw and MK Veldhuis (eds.) AVI Publishing Co., Inc. Westport, Conneticut, USA.